We’d love your help. Let us know what’s wrong with this preview of The Second Mountain by David Brooks. A thought-provoking exploration of the four major commitments in life that fundamentally shape our identities—from the #1 New York Times bestselling author of The Road to Character. Every so often, you meet people who radiate joy—who seem to know exactly why they were put on this earth, who glow with a kind of inner light. Life, for these people, has often followed a two-mo A thought-provoking exploration of the four major commitments in life that fundamentally shape our identities—from the #1 New York Times bestselling author of The Road to Character. Every so often, you meet people who radiate joy—who seem to know exactly why they were put on this earth, who glow with a kind of inner light. Life, for these people, has often followed a two-mountain shape. They get out of school, they start a career, and they begin climbing the mountain they thought they were meant to climb. Their goals on this first mountain are the ones our culture endorses: to be a success, to make your mark, to experience personal happiness. But when they get to the top of that mountain, something happens. They look around and find the view . . . unsatisfying. They realize: This wasn’t my mountain after all. There’s another, bigger mountain out there that is actually my mountain. To ask other readers questions about The Second Mountain, please sign up. 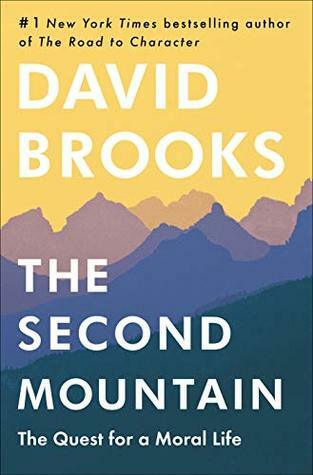 THE SECOND MOUNTAIN by David Brooks is a complex book that is part philosophy, part personal disclosure, and part research. It serves as an excellent source to challenge the reader’s thinking about a variety of subjects including religion, marriage, social responsibility and personal growth. It is a book that requires a great deal of thought to absorb what is being said and to time for introspection to ascertain personal reactions. For this reason, I found it easiest to read a section and then THE SECOND MOUNTAIN by David Brooks is a complex book that is part philosophy, part personal disclosure, and part research. It serves as an excellent source to challenge the reader’s thinking about a variety of subjects including religion, marriage, social responsibility and personal growth. It is a book that requires a great deal of thought to absorb what is being said and to time for introspection to ascertain personal reactions. For this reason, I found it easiest to read a section and then put it aside for a few hours or a day to think about what I had read. The writing is erudite in many spots, and as such is not something one can easily skim, nor would you want to. There are many ideas put forth in terms of what David Brooks himself believes to be true. Whether or not you believe everything that is discussed in the book, it will give you an opportunity to pause and think about some important issues in society today. Of particular interest to me was the section on becoming a servant leader, one who takes as their focus the improvement of the world around them instead of simply trying to focus on improving their own situation in life. The portions of the book that deal with the hyper-individualism we as a society have gravitated toward over the past sixty or so years. He sites the erosion of old-fashioned neighborhoods as one of the more easily seen examples of this process. He also talks about the perils inherent in becoming more isolated, more divided into groups of like individuals and his argument has a ring of truth to it as society seems to be becoming more intractable in its ability to listen to points of view other than our own. At times I found myself wondering who was the target audience for the book as it wanders across a vast array of topics. Equal space is given to such disparate subjects as joy, social responsibility, religion, and a host of others. The quotes given in the book provide the reader with a wide range of philosophies on an equally wide range of subjects, almost compelling the reader to pause and think. Is it something with which they agree? Where do they fall philosophically on a variety of topics. Because of this, the reader may find this a longer than average read for them to complete. While I would recommend this book as something to read for stimulating thought and defining personal philosophies, I would not recommend it as something the reader would pick up for light reading. In places it reads more like a textbook, and there were times when my brain simply would not absorb what was being said. For that reason, I chose not to read this as my “late evening” read when winding down for the night, but saved it for times when I had a fresher brain and enough time to carve out a section to complete before being called to do something else. This book may be helpful for people who are seeking to define their own values or learn about how others have moved through that process. It is a book that also offers hope for finding “joy” to put in your life in addition to fun and purpose. There is also caution regarding where society is heading if it continues on its current isolationist path. Perhaps the best thing that can be said for this book is that it will encourage you to think, and possibly to act, in ways that may be new to you. Gail C. Karen wrote: "Excellent review. I’ve just started reading and can’t wait to continue. I love David Brooks’ writing." Thanks,Karen. I like the way he pu Karen wrote: "Excellent review. I’ve just started reading and can’t wait to continue. I love David Brooks’ writing." The usual windy drivel by one of America's biggest moral hypocrites. Naturally, it's full of the sort of self-serving justifications he uses for his own vile amorality in callously abandoning his long-time wife for a younger woman, then chastising her in the pages of the New York Times, no less, for not taking his abuse with "dignity". He even went so far as to imply she was stalking him, smirked about her desperate love for him, bragged about how much pain he was causing her, and, in a staggeri The usual windy drivel by one of America's biggest moral hypocrites. Naturally, it's full of the sort of self-serving justifications he uses for his own vile amorality in callously abandoning his long-time wife for a younger woman, then chastising her in the pages of the New York Times, no less, for not taking his abuse with "dignity". He even went so far as to imply she was stalking him, smirked about her desperate love for him, bragged about how much pain he was causing her, and, in a staggering display of narcissistic entitlement, admonished her for not being happy for him, all while implying *she* is a narcissist. He even tried to justify ignoring his children as treating them like adults and helping them to mature. He actually tried to paint dismissive treatment and emotional neglect as a parental duty. All that in one article. This book is a rationalization for all his cretinous behavior as being about personal growth. His navel gazing has a vomitously new-agey feel, as if he's channeling both Deepak Chopra and Donald Trump's ego. Giveaway won, not yet received.